SAFE PORCELAIN - Made in China of Fine Stoneware Ceramic, Non-Toxic and Harmless, FDA Certified Lead and Cadmium Free. 12.25"rectangular plate. 1 2.25"rectangular plate. 1 10"dish. TEMPERATURE RESISTANT - Fired in High Temperature, Not Easy to Be Broken. White Crockery Double Well Saucer 6" (Box of 12). White Crockery Latte Mug 24cl (8.5oz) (Box of 12). White Crockery Wide Rim Plate 6.75" Side Plate (Box of 12). White Crockery Cappuccino Cup 12oz (34cl) (Box of 12). 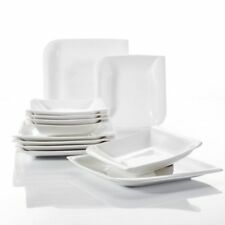 6 x Square White Habitat Bistro Side Plates. Approx 18 cm across. or Collection jct19/M25. Microwave, freezer, oven and dishwasher safe. • Pure white appearance. • Material: Fine China. • Square style plate. • Alumina in body for extra resistance. Royal Genware Porcelain Square Plate 6.25" (16cm). Pure White crockery is microwave and dishwasher safe. ISLE OF MAN, ISLE OF WIGHT, GUERNSEY, JERSEY &CHANNEL ISLANDS. Pure White is Run of Kiln and therefore this grading isn’t part of the manufacture process. AKCENT SERIES- 21cm dessert plates. AKCENT design. Product details. SAFE PORCELAIN - Made in China of Fine Stoneware Ceramic, Non-Toxic and Harmless, FDA Certified Lead and Cadmium Free. 12.25"rectangular plate. 2 12.25"rectangular plate. 2 10"dish. TEMPERATURE RESISTANT - Fired in High Temperature, Not Easy to Be Broken. 6 10.5" Dinner Plates. 10.5"dinner plate. Dishwasher,freezer and microwave safe oven to table. Add a touch of class and finesse to your dining. With an extraordinary translucence, it is delicate in appearance, yet surprisingly hard-wearing. Entry Level Porcelain. White Crockery Double Well Saucer 6" (Box of 12). White Crockery Latte Mug 24cl (8.5oz) (Box of 12). 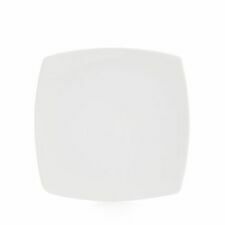 White Crockery Wide Rim Plate 6.75" Side Plate (Box of 12). White Crockery Cappuccino Cup 12oz (34cl) (Box of 12). AKCENT SERIES- 26cm DINNER plates. AKCENT design. set of 1 plates. Product details. "Easter Morning" Design. Design : Easter Morning. 1 x Porcelain Plate. Material : Porcelain. Colour : White. Sea Monkeys / Aquasaur s.
LARGE DINNER PLATES. Set of 4 plates. Microwave safe. Dishwasher safe. Royal Genware Porcelain Square Plate 12" (30cm). AKCENT SERIES- 26cm DINNER plates. AKCENT design. set of 2 plates. Product details. Entry Level Porcelain may have slight imperfections. White Crockery Double Well Saucer 6" (Box of 12). White Crockery Latte Mug 24cl (8.5oz) (Box of 12). White Crockery Wide Rim Plate 6.75" Side Plate (Box of 12). Serve your pasta plates with style. "CUBIC SERIES". White porcelain. Product details. Suitable for professional use at restaurants. AKCENT SERIES- 26cm DINNER plates. AKCENT design. Product details. 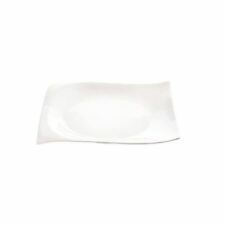 These pure White square plates are ideal as a starter plate, cake plate or dessert plate. • Starter Dessert Plates. • Can be used as a starter, cake or dessert plate. The Orion range of porcelain tableware is elegant and beautifully designed, which is luxurious but practical. White Crockery Latte Mug 24cl (8.5oz) (Box of 12). White Crockery Stacking Cup 7oz Tea-Coffee Cup (Box of 12). 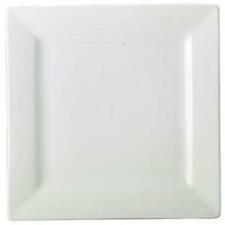 White Crockery Wide Rim Plate 6.75" Side Plate (Box of 12). White Crockery Oval Plate 12" (30cm) (Box of 12). Dishwasher safe. • Triangular plate. • White glazed finish. Ordering Information • Dishwasher safe. AKCENT SERIES- 26cm DINNER plates. AKCENT design. set of 6 plates. Product details. The plate is stackable, helping maximise storage space, and oven, microwave, dishwasher and freezer proof. Colour: White. Shape: Square. Fully vitrified for heat and shock resistance. Oven, microwave, dishwasher and freezer proof. LARGE DINNER PLATES. Set of 2 plates. Microwave safe. Dishwasher safe. • Square style plates. • Resists cutting marks and scratching. Ordering Information. A genuine hand engraved decorated under glaze with detergent and acid resistant colouring. 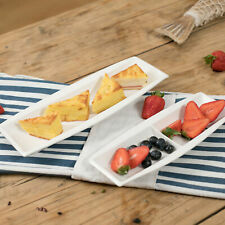 These pure White square plates are ideal as a starter plate, cake plate or dessert plate. • Starter Dessert Plates. •Can be used as a starter, cake or dessert plate. The Orion range of porcelain tableware is elegant and beautifully designed, which is luxurious but practical. Mini Square Porcelaine Plates For Appetizer White ,6 piece.